If I change my member name, will I lose my points? How can I limit when the software connects to the Internet? How do I select a country name? How do I change my country name? May I install as a service? How is my individual member rank calculated? Are all volunteer data visible on World Community Grid? Select Settings from top right of any webpage. Sign in using your current member name and password. Select My Profile from the menu on the left. On the My Profile page, change the Member Name. Go to the World Community Grid home page. Click 'Settings' option at the top of the page. No, changing your member name will not affect your points or any other contribution that you've made to World Community Grid. The member name recovery feature uses your email address to identify and send your member name. Go to the World Community Grid home page and sign in using your current member name and password. Click on Settings in the upper right corner, or click here. Click on the My Profile tab on the left hand side of the page. On your machine, go to [Start] [Settings] [Control Panel] and double click on "Internet Options." Click on the [Connections] tab. There will be 3 radial buttons towards the bottom of the window; set them to "Never dial a connection." Because the software operates like any other Windows application and simply requests an Internet connection that Windows then provides, doing this will force Windows to ignore requests for an Internet connection. You must therefore manually initiate a connection to your ISP to connect to the Internet. Enter the Device Profiles section of the site. Next click on the default profile and follow the instructions to change the execution time for your computer(s) and save. This will change the connection times for all computers under your member name. To change the connection times for a particular computer under your member name. 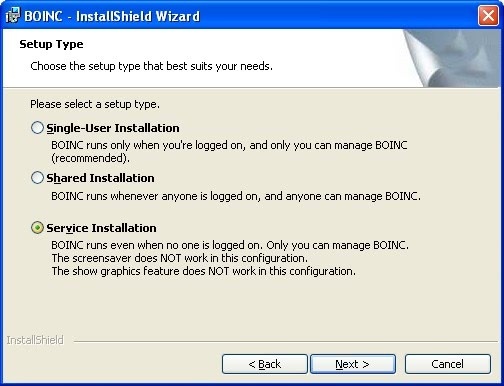 Double click on the World Community Grid, or BOINC, icon in your system tray. Select Preferences and designate your preferred connections times and select “save”. Click the Settings link at the top of the page. On the My Profile page, select the country of your choice. Select the My Profile option from the menu on the left. Yes. To install as a service, simply select that option during the installation process. A graphic of the service install option is reflected here. A member may see their individual stats on their My Contribution page for run time, points, and results returned. Your individual rank is based on the total number of members that have returned a result. You may see how many members there currently are on the Global Statistics page. World Community Grid volunteers have the option of making their data public or private. If a volunteer opts to make their data private, their information (including their member name, contribution statistics, etc) is not visible to others on the statistics pages of our website nor available in data exports. This does not impact the visibility of aggregate-level statistics.